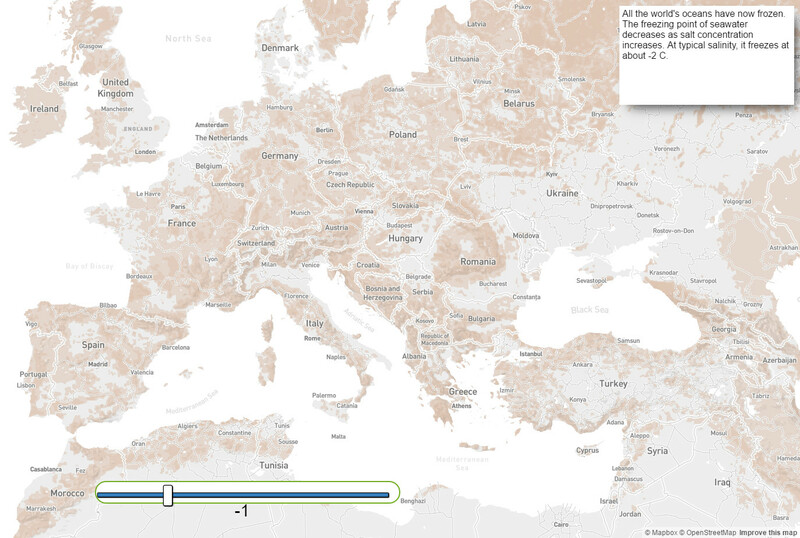 Adjust the temperature of planet Earth using the slide control to view a wildly inaccurate map of how the world might be affected by global cooling. The average global temperature of the Earth is around 15 degrees centigrade. Obviously average temparatures vary depending on where you are on planet Earth. The average temperature at the equator is far higher than it is at the poles. Even a one or two degree drop in the global average temperature could have a large effect on Earth. During the so called Little Ice Age (roughly AD 1300 - 1850) average global temperatures were only one-two degrees colder than the present global average temperature. In the last Ice Age the average global temperature was close to five degrees lower than today. In the Ice Age much of central Europe and the northern United States were covered with kilometers of ice. In the short term longer winters and colder springs will result in crops failing and widespread famine. When the average global temperature of the Earth falls below 10 degrees centigrade much of the world will likely have a tundra climate. In this type of climate most crops will fail and tree growth is severely hindered. Moss and lichen may still grow. It may still be possible to grow crops at the equator and low latitudes - but not enough to feed the world. Most high latitude areas would soon become uninhabitable. There are a number of possible factors that could cause global cooling. These include sunspot activity, changes in atmospheric circulation and major volcanic eruptions. Sustained global cooling at this level will almost certainly mean the end of civilization as we know it. It is possible that small nomadic tribes may be able to contine to live in a similar manner to present day Inuit groups. Most mammalian and plant life on the surface of planet Earth will become extinct. Only a few highly adaptable species are likely to survive. Marine life might fare a little better. All the world's oceans have now frozen. The freezing point of seawater decreases as salt concentration increases. At typical salinity, it freezes at about -2 C.
Although the seas would freeze on the surface, this surface ice layer would insulate the deep water below and prevent the oceans from freezing solid for hundreds of thousands of years. Some animal life possibly continues. Alaskan Wood Frogs for example have been known to survive temperatures as low as -28 C. It is unlikely however they would survive for long at that temperature.